In this book, Sanjoy Mahajan shows us that the way to master complexity is through insight rather than precision. Precision can overwhelm us with information, whereas insight connects seemingly disparate pieces of information into a simple picture. Unlike computers, humans depend on insight. 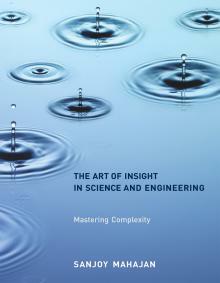 Based on the author's fifteen years of teaching at MIT, Cambridge University, and Olin College, The Art of Insight in Science and Engineering shows us how to build insight and find understanding, giving readers tools to help them solve any problem in science and engineering. Sanjoy Mahajan studied mathematics at the University of Oxford and received a PhD in theoretical physics at the California Institute of Technology. He is now Associate Director of the Teaching and Learning Laboratory and a Lecturer in the Department of Electrical Engineering and Computer Science at MIT. Before coming to MIT, he was a Fellow of Corpus Christi College, Cambridge, and a Lecturer in Physics in the University of Cambridge.